The manufacturing plant on Route 545 near Olivesburg used to form metal rods out of molten iron and produce cement blocks for railroad construction projects. It is said that in the 1940s, a large iron kettle chain broke and poured molten metal onto five workers. All five workers died slow, painful deaths immersed in iron. The plant has been closed down for years, but it is said that the spirits of the five workers will speak to you if you visit on specific nights. This 100-year-old slaughterhouse, which closed down in the early 1920s and was demolished just this past year, was described as one of the most state-of-the-art abattoirs in the country at the time. The looming six story structure that sat abandoned on the bank of Cape Fear for decades was allegedly haunted by the ghost of the soon-to-be-bankrupt Cape Fear Packaging Company owner, who was said to have hanged himself in the middle of the building. Constructed in the 1860s, this massive munitions manufacturing complex originally made bullets and cannonballs for the Union Army during the Civil War. In fact, the Peters Cartridge Company building saw the production of bullets and explosives for more than a century until it was shuttered in the late 1950s. It's indisputable that many workers lost their lives in the many industrial accidents, explosions and fires common to the munitions industry. According to visitors, ghosts are sighted occasionally in the upper windows, footsteps cross the upper floors and roof late at night and the elevator cables sometimes swing for no good reason. 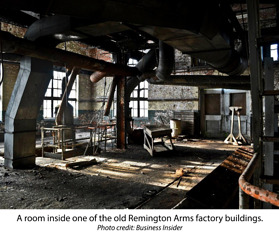 Perhaps the most famous haunted manufacturing facility in our list today is the old Remington Arms plant. Comprised of 38 buildings over 73 acres, the massive Remington factory was one of the largest ammunitions plants in the world. But industrial accidents were commonplace in factories that large, such as the 1942 explosion that claimed the lives of seven people, injured 80 others and shot countless bullets through nearby buildings and neighborhoods. Closed in 1986, the Remington Arms building is now patrolled by the Bridgeport police who have seen moving shadows, heard disembodied voices and screams and witnessed other unexplainable events. The old ammunition factory was featured on an episode of the Travel Channels' Ghost Adventures in 2009.